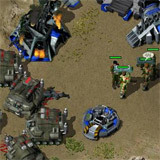 Welcome to the largest community driven website dedicated to the real time strategy Original War. If this is your first time interacting with the online community here or even with the game itself, take a few minutes to read the below summary of what Original War is and everything the Original War community currently offers. If you like the RPG and RTS game genres, then you must have at least heard of a game called Original War at some point. It was first released in 2001, quickly earning awards and praise from reviewers worldwide. Before the community patches, Gamespy Arcade was the program of choice to use to set up multiplayer games. In time Gamespy abandoned their GSA service however, and the community required a suitable alternative. The answer was simple: create a central server that would display all online games currently in progress, and allow the community a place to chat. The Original War Master Server project was born. As the multiplayer community grew, it became more competitive. Clans were formed, rules were established and some players became well known for their gaming skill. This created a need for a ranking system that would keep track of online matches so that it could be documented once and for all who is the best Original War player. With the help of Stucuk the capability to record match outcomes was built into Original War itself, and integrated with community accounts on OW.net, which enabled the system to basically run itself. The latest version of the Ranking requires patch 1.11.0 or higher. Officially opened in January 2006, OWSupport is where new Original War patches are created from community input using the Original War source code that was given to Stucuk by Altar Games. One of the first suggestions for the very first community patch was enabling advanced modding capabilities for Original War. With the release of patch 1.03 and the tools needed to edit the core game files, Original War modding was made an easy reality.